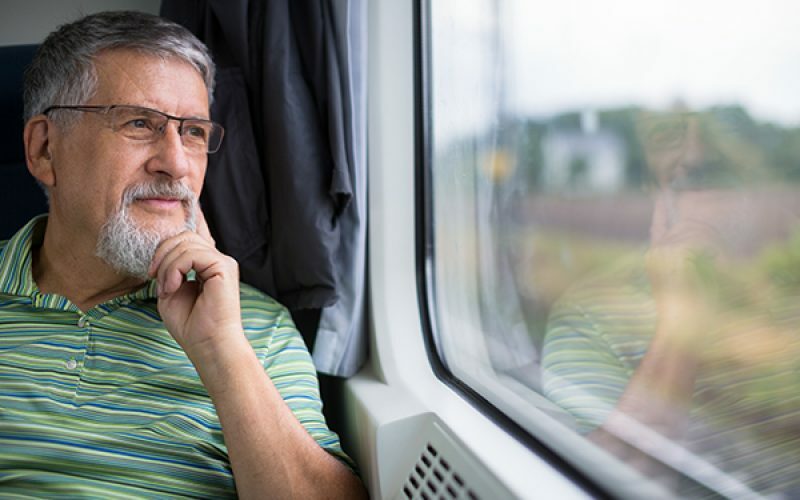 If you’ve never booked a packaged motorcoach trip with us and want to know a little more about what to expect, this blog post is for you! If you have booked and traveled with us and have wondered why we do some of the things we do, this blog post is for you, too! 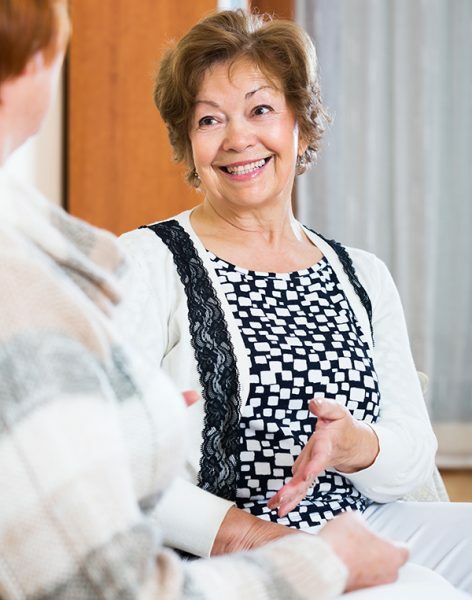 Your personal, one-on-one experience with our professional staff starts with a phone call. Our Travel Advisors have a combined 95 years of experience. They can answer all of your questions and help plan your perfect vacation. What can you expect from your Travel Advisor? Your Travel Advisor will be very friendly and courteous and will ask you questions to help you find the trip that is best suited for you. Sometimes you may have a specific trip in mind and sometimes you may ask for advice or suggestions on trips to take. Our Travel Advisors can steer you in the right direction by getting to know you better. You’ve found the perfect vacation, and you’ve made your reservation. Now what? Your Travel Advisor will mail or email you a reservation confirmation along with any additional information you may have requested about the trip. Your confirmation will note your final payment due date, your departure location and your seat assignment. When you travel with Starr, it’s important to bring a valid government issued photo I.D. such as a driver’s license (for domestic travel) or valid passport (for international travel, including trips to Canada). Passport applications can take several weeks to process, so we recommend you apply for one as soon as you book your trip. If you are leaving the United States or going on a cruise, a passport is required. Likewise, some destinations require a valid government issued photo I.D. For example, casinos require them if you want to get the slot play they offer in their casino package, and many of our government and military sites like Parris Island, West Point, and the US Naval Academy also require them. Your trip is almost here! How do you pack and prepare? Ok, you are almost ready to take your trip but first there are a few additional items I want to share with you. This is good information for you as well as the other people traveling with you. Arrive at your departure location least 15-30 minutes prior to your departure time. This allows you buffer time for traffic and whatever else might come your way. (We just had a passenger miss her bus because a penny truck overturned, spilling pennies all over the highway, causing major traffic! Some things you can not foresee.) Remember to make sure you have your ID and boarding pass with you. If you are traveling on a multi-day trip, you are allowed to bring one suitcase per person and one carry-on item (like a handbag or messenger bag-not the airline size carry-on!). You should pack medications and any other necessities in your carry-on bag. Your suitcase will be stored under the bus and then taken by the hotel to be delivered to you room. Sometimes, it takes a little while for the hotel to get everyone’s luggage sorted, so it’s best to have any immediate need items with you. Remember, there is a limited amount of space for carry-on items so please use a small bag. The overhead compartment on the bus is not as spacious as those on an airplane. You are welcome to bring along snacks and soft drinks. The driver will provide bags for your trash as we like to keep the bus clean. Consider bringing a travel pillow, throw blanket or comfy shoes to make the ride more cozy. Think about dressing in layers so you can find the right temperature balance between your comfort zone and the conditions on the bus. Please be considerate of other passengers on the bus. Do not wear strong perfume or cologne. Please restrain from talking on the phone and using personal electronics without a headset. We pack a lot of fun into each trip so please adhere to the schedule set by your Tour Director. Your Tour Director and Driver are very knowledgeable about Starr, your bus and your destination. They love to share their knowledge. Many of our Drivers and Tour Directors have been with Starr for a long time. We encourage you to interact with them to enhance your experience. You’re home after a great trip with fond memories and ready to go again! Starr will provide a Confidential Survey for you to fill out upon completion of your trip. These surveys are reviewed by several people in our office and we take your words very seriously. Take the time to fill it out! We learn from customer feedback and use these comments to continually improve. We want to hear from you! Occasionally, our Tour Directors and travelers will send us photos from the tour. We often post these photos on our Facebook, so connect with us and check our page often for special announcements, trip photos, and more fun stuff! We enjoy seeing you while on tour so we invite you to post to our page as well. Now that you have traveled with Starr, you will receive our catalogs in your mailbox. We enjoy highlighting our tours and giving you new destinations to get excited about, so be sure to take a look at them. Once you find a tour you’d like to book, or if you have any questions, give us a call! Your Travel Advisor looks forward to hearing from you! Wine is a wonderful way to complement nearly any meal. From seafood to steak, to the most decadent of desserts, a nice glass of something red or white can complete your entire dining experience. But do you know what pairs best with your entrée? Experts say that you should always drink “light to dark.” This means that with appetizers, such as cheese or salad, start with a light dry white wine. Examples of this could be Sauvignon Blanc, Pinot Grigio, or Albarino. Light dry whites also pair well with fish. 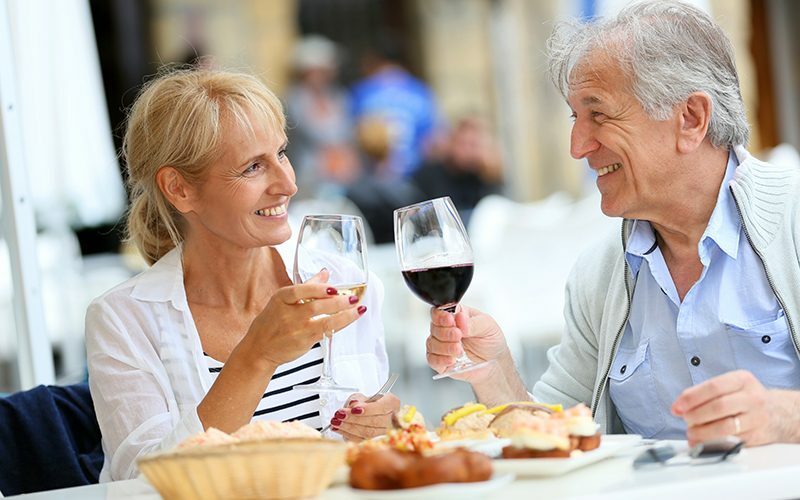 Your sweet white wines, such as Riesling, Chenin Blanc, or Moscato (my personal favorite), pair best with soft cheeses, carbs, cured or smoked meats, and desserts. Rich whites, like Chardonnay or Oaked Whites, go together with roasted veggies, carbs, rich fish (like crab/lobster) or white meat. If you prefer something sparkling, like champagne, the taste is best suited with appetizers or with fish. All of your standard red wines pair best with meat, as they embody a fuller, richer taste. A light red wine like Pinot Noir can easily go with rich fish as well, like crab or lobster, and can also pair with chicken. For your red meats and cured or smoked meat, your best bet is to go with a deeper red (a medium or big red) like Merlot, Tempranillo, Cabernet Sauvignon, or Zinfandel. Finishing off your wines with big flavor are the dessert wines – Port and Tawny Port, Sherry, or Lake Harvest. These wines naturally pair well with dessert, cured and smoked meats, or carbs. If you’re more interested in pairing by flavor, with items such as pasta, which typically boasts of tomato-based red sauces, then look for a versatile wine like Pinot Noir. If your dish has a bit of a spicy kick to it then you might prefer a red wine like Sangiovese. When all else fails and you find that your dish has a variety of flavors and cannot figure out which wine would go best, consult your waiter’s opinion. They are usually very knowledgeable on these pairings as well and will be happy to help you find the right wine for your meal. Often times, a restaurant may even offer a tasting to help you see if the wine suits your preference. For further consideration, I highly recommend this chart to help you better decide your pairing. Happy tasting! Traveling solo can seem a bit daunting or lonely, but it does not have to be! Making friends when traveling solo just requires a little bit of effort – and sometimes a willingness to try something new. It serves even the most introverted person well to get out of the box once in a while. Take your trip and dare yourself to make a new friend! At Starr, many of our trips require a bit of time before reaching your destination. Instead of plugging in headphones or turning to the next chapter in your book, why not start up a conversation with your fellow travelers? You already have your destination in common. With that knowledge, you can simply ask what they are looking forward to seeing on the trip, have they visited before, etc. Make the most of the drive by socializing. Dining with others is always an easy entry to making small talk. A few simple conversation starters are: Where are you from? Is this your first trip with Starr? What has been your favorite part of the trip so far? Open-ended questions are always best because they leave room for the conversation to grow. Don’t expect everyone to have everything in common with you. It’s a GOOD thing to meet new people who are passionate about different things. Be open to people with diverse backgrounds and interests, varying ages and life experiences. This gives you the opportunity to learn from each other and you might find out you have more in common than you think. Don’t be discouraged to make a new friend or let your fears hold you back. Many times, we can “clam up” if the conversation goes dry. If that happens, just ask another question! Don’t ask personal questions too quickly or act nosy. This can deter people away. This might be the most important tip. If you’re anything like me, you might make excuses for meeting people or trying something new. You might say you’re too old, too young, too scared; the list goes on. Leave the excuses at home and meet someone new. After returning from your trip with new friends, find a way to keep in touch. It may be a little awkward to say, “Hey, I really enjoyed spending time with you on this trip. Would you like to exchange numbers and meet for lunch sometime?” but put yourself out there. The worst they can do is say no. Exchange numbers and other contact info – connect over social media. Find a fun class to take together or, better yet, plan to get together again on another Starr trip! A friend you meet traveling can easily turn into a friend for life! When traveling solo, one of the best things you can do for yourself is to put your fears aside and enjoy the adventure. Strike up a conversation while standing in line or step out of your comfort zone to try a new class. There’s no need to stick to the norm, especially when it comes to meeting new people. Traveling solo is all what you make of it. Make your trip a great one and make a new friend! At Starr Tours, we are lucky to have a large mailing list (both snail mail and email) of people who have traveled on our bus tours. As you can imagine, every Tour and Travel company needs new customers to replace those who can’t or don’t want to travel anymore AND to be able to grow their business so they can offer great trips at a fair value. So, how does Starr grow our market of customers? Our #1 way to add customers to our database is from our Refer-A-Friend program. Once we receive your referral, we will send your friend a new customer savings certificate worth up to $25! Lucky them! Then, we enter you into our $250 monthly Refer-A-Friend Sweepstakes. 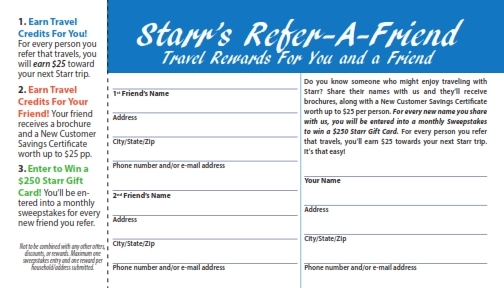 And when your friend travels with Starr for the first time, Starr will send you a $25 Starr Gift Certificate! Thanks to the success of this program, we add thousands of new customers to our database every year – and we have given away thousands of dollars in gift cards! History has shown that once people receive our catalogs, they will find a trip that suits their interests and then they will become a Starr traveler! Our #2 way to add customers to our database and our trips is through offering Coupons to New Customers. Like many businesses, Starr publishes coupons to attract new customers. We place these coupons in the newspaper as well as mail them to people whom you have referred or who have found us on their own. Coupons are a proven method for enticing new customers toward a business. We offer first time Starr travelers a discount: $10 for a day trip or $25 for a multi-day trip. We hope this coupon program encourages people to try one of our bus trips. Then, after receiving a discount and also discovering first-hand how great our bus trips are, we hope those customers who have tried us for the first time will become a regular part of the Starr family of travelers. The truth is that coupons create a win-win situation for both companies and consumers. Businesses benefit from coupons through increased customers. Research has correlated coupons directly with brain chemistry that is linked to happiness. Consumers who receive $10 coupons have 38 percent higher Oxytocin levels, 32 percent calmer breathing rates, 5 percent slower heart rates, and 20x less sweaty palms. Isn’t that great news?! And certainly customer satisfaction matters. Happy customers rate companies better on review sites like Yelp, Facebook and Google and they are more likely to come back as well as tell a friend. They are more likely to sign up for a company’s email list or “like” its Facebook page. And, did you know that 60 percent of people are willing to post about a product or service if you offer them a discount? These are all positive outcomes for a business – and Starr especially. That’s a great question! Starr vacations are value-priced. This means we don’t put a high markup on them therefore we don’t discount them. No senior discounts. No frequent customer discounts. No discounts. Period. We want to give all customers the same, fair price so when they purchase their trip and get on the bus, they know that they paid the same price as the person sitting across the aisle from them. Of course, this is not the same way that airlines or hotels price. How did you feel the last time you sat next to someone on a plane or heard someone check into a hotel and they were paying a lower rate? I thought so! So, if you like our trips, please encourage your neighbors, friends and family to travel with Starr. This way we can be around for another 70 years!